Just a quick post, I need to dig out my tiara and decide whether a veil is a little de trop. Yes, I'm off to a tea party tomorrow to watch the nuptials of Wills n' Kate - a televisual extraveganza which promises to be an unholy alliance of Pantene advert and Songs of Praise. I asked if I should bring booze, but was informed that a 10am start rendered champagne unnecessary. However, it did present an opportunity to use my rather fabulous giant crown cookie cutter from Cox and Cox, which normally resides on my kitchen wall. The smallest boy and I made a load of gingerbread dough, and then spent a satisfying few minutes pulverizing boiled sweets in my electric mini chopper. Coo - Cath K colours and Union Jacks? I hadn't made 'stained glass' effect biscuits before, but they came out ok after a bit of trial and error. The methods I looked up all suggested cooking for 5 minutes, but there was no way that would be long enough for my gingerbread recipe. Instead I cooked the dough for 10 minutes at 160 degrees, then filled in the 'jewel' spaces with the crushed sweets, before putting it back in the oven for a further 10 minutes. This melted the sweets nicely, without them burning. If you try these, make sure you line your baking tray with oiled greaseproof paper first - learn from my mistakes and save yourself the blood, sweat, tears and broken spatula. Also, lovely as the crown cutter is, it's an absolute bugger to move the dough from your surface to the tray. It's really large and also full of weak points from the holes - the little heart biscuits were far easier. I'm definitely going to do those for Valentine's day, and some star shaped ones for Christmas. Have a fabulous bank holiday weekend all! ﻿I visited the Dulwich Picture Gallery recently, and found myself transfixed by this Gainsborough portrait. I had the small boys with me - they'd been fortified with chips in the cafe - and of course they assumed Samuel and Thomas were little girls. Understandable, as boys in the 18th century would have worn dresses like this until they were at least 5. You can imagine how my Year 1 boy felt about that! Despite having more than a passing interest in vintage clothing, I'm still intrigued by how my own perception of gender is shaped by our modern experience of dress. However, what really fascinated me was learning that x-rays have revealed that orginally, the portrait was of Elizabeth alone, her hand raised, playing with a string of pearls at her throat. This original has been dated to c1780. She died in 1782, when her sons were mere infants - Samuel was born in 1781, and his brother the year after. 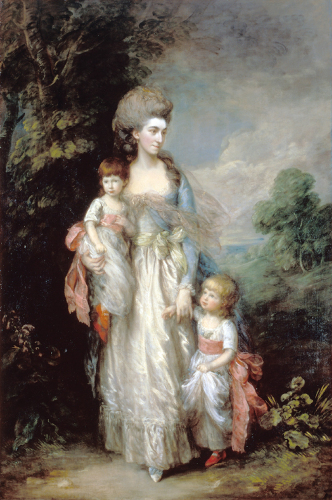 The painting was modified after her death to include the boys, held by their mother at an age she never saw them. Would Samuel and Thomas have grown up adoring this last connection to the mother they would never know, as we cling to photographs of family members we have lost? Or did it act as a memento mori - remember you too must die? We're all vintage lovers, but who today feels connected with the morals and mores of 230 years ago? With modern tools such as Photoshop we could recreate with a few clicks what Gainsborough so painstakingly repainted. We've seen the late James Dean advertise cars; Marilyn, Einstein and Elvis still pop up - their images used long after their deaths - but would we doctor a family photograph? The reason I ask is connected to a pair of photos I'd like to show you, from my own family. 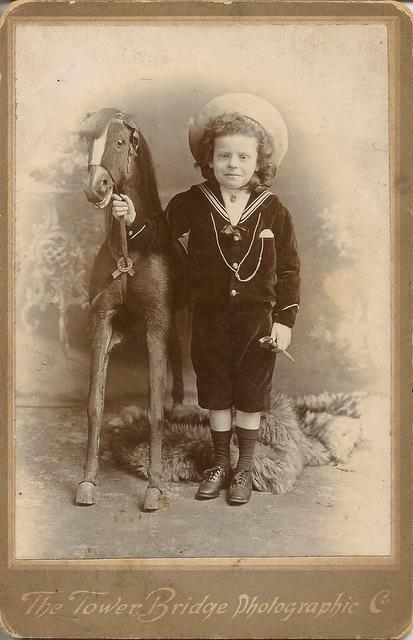 This picture is my maternal Great-Grandfather George as a small boy, posing in his sailor suit with a rather skittish looking stuffed horse. I'm not sure when it was taken, but I would guess at around 1900. 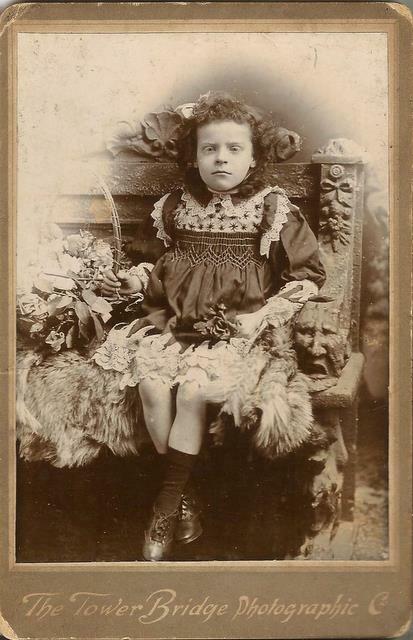 Yes, it's George again, forced into a frilly dress and with the most truculent expression on his face. I've known about these photographs for a few years, but was reminded of them immediately that I saw Mrs Elizabeth Moody... However, I only today realised that the basket he's holding contains bay leaves, which in the Victorian language of flowers means "I change but in death". I'm not sure what parent would today dress their son up as his deceased twin sister - I imagine in modern parenting terms it's a no-no - but I can understand their need to keep a connection with their daughter. And who knows, maybe George later found comfort from it too, as the Moodys did from their painting, a century before. Terms of acceptance dictate that I pass this on to some other bloggers and also share 10 facts about myself. I know that blog awards aren't everyone's cup of tea, but if I tag you, please just see it as a compliment and that I enjoy your blog. There's no pressure to accept and pass it on if you'd rather not, though if you'd like to, great - I love finding new blogs on recommendation. There are so many I enjoy and I could have awarded any of Scarlett's other picks, but I thought I'd concentrate on some newer (to me, anyway) bloggers and a couple of old favourites. 1. I'm a published poet - including one on the London Underground - and also write occasionally for a poetry magazine. 2. I get hiccups. All. The. Bloody. Time. 3. I have a terrible sense of direction. "Getting into the map" a la Joey from Friends seems perfectly reasonable to me. 4. My eyes are slightly different colours. Many people have felt the need to tell me, as though I was unaware of it - usually after knowing me for about 5 years and suddenly noticing. 5. I don't generally wear makeup unless I'm going 'out' out, but I don't really feel dressed without earrings. 6. I really dislike egg white. (unless in the form of a meringue, naturally). Otherwise, I'll eat anything. 7. I can recite pretty much the entire script of The Lost Boys, having watched it approximately 2,511 times. 8. Despite not being the target demographic (and having a degree in English Literature) I really quite like the Twilight books. 9. I daydream all the time, generally about film type scenarios. Hence I know how I would kill someone who ever hurt my family, what I would change my name to if I was on the run, how I would escape from a car boot etc. That's normal, right? As this is a somewhat self-indulgent post, can I also take this opportunity to thank all my followers for making this blogging malarky fun. I have noticed quite a few new names on board recently, and I really appreciate it, whether you comment or not. And if I haven't managed to visit your blog lately, I apologise, I do try to keep up. Hope you're all enjoying some time off with your families - did you miss me? I've had a lovely time down here in South Wales which astoundingly is enjoying the same weather as the rest of the UK. Don't worry, I'll get to the bargain hunting, but first here's a picture of the boys on our favourite Gower beach, Caswell Bay. Isn't it amazing? Anyway, we did make it to a local carboot sale, which had the odd hidden gem in addition to the 'misshapes' meat stall and stand selling plastic guttering (still with dirt from the houses they'd been taken from). The former was pronounced a 'Tidy Buy!' from the signage. I'm all for a bargain, but I do draw the line at non-specific meat squished together and sold at a boot sale! Despite being no longer 'local' they allowed me to pay my 50p, and I found a few bits and pieces. I also bought a School Friend Annual from 1956, some French glass bottles which I'll put bubble bath in, and two bags of shells. I stumbled across a great bit of driftwood at the beach (literally, it bloody hurt) so I have a plan to make some kind of coastal mobile affair out of that and the shells. Outside Happy Days Vintage Emporium was a selection of plants, outdoor bunting made of oilcloth, vintage clay pots and so on, and inside was a treasure trove of furniture, clothes, homeware, books and ephemera. Prices were on the whole pretty reasonable for a dedicated indoor vintage market, where everything has been handpicked for enthusiasts by enthusiasts. In the end I came away with a traditional Welsh blanket from Ruby Redhead's stall﻿. It's a large one, and the colours are still bright and new looking. My camera hasn't quite got the colours captured, but it's a bright spring green and a light salmon pink - typical 50s shades. There are two tiny moth holes which I can repair, but on finding them the lovely proprietor knocked £8 off the price - so it cost me £30. Similar sized blankets which are woven today by companies like Melin Tregwynt cost £225. That said, their spot patterns are gorgeous modern classics and probably well worth the investment. Blanket. Headed for the freezer just to make sure there are no living moths! We took a break for lunch, then continued the shopping frenzy. I almost missed this Red Cross shop thinking it was a boutique (for ladies of a certain age, admittedly). It's next to The Linen Closet - which I know a lot of you would love - full of goodies from Cath K, Emma Bridgewater, Dotcomgiftshop et al. 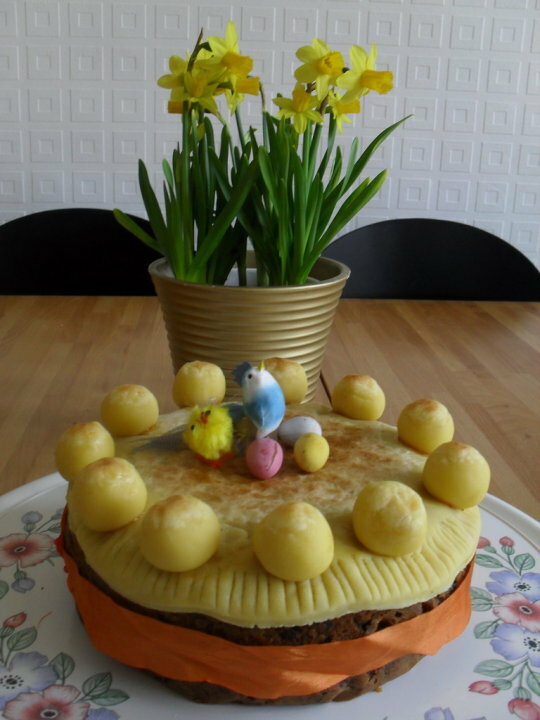 *Happy Easter. How are you? ﻿This week I've been admiring a lot of bloggers' use of thrifty finds for new or unexpected purposes and thought I'd have a look around the house and see if there was anything I could share. Unfortunately, I discovered that I'm not one of these innovative crafty people who can make a chandelier out of nothing but a pile of wire hangers and some vintage earrings. My babies never slept in a vintage steamer trunk, and my garden doesn't have a single gazebo made from heirloom patchwork and an arts and crafts curtain pole. Bah. So, instead, here are one or two pictures of things I've found recently, plus a couple of things I've had for years, holding things they weren't originally intended to. I will try harder, and if I ever make that bird house out of a Queen Anne teaset, you'll be the first to know. I'm off across the Severn Bridge tomorrow (home to Wales for a week) so am hopeful of some cheaper treasure hunting than usual. Will report back as to whether the Swansea valleys offer an untapped goldmine or more over-priced Primark tat. "Lakota and her necklace, sitting in a tree..."
Morning all! Gaze in wonder at my lovely necklace from Stolen Thunder, which after a long battle with the postal system, finally turned up yesterday. I'm so in love that it's become my new profile picture. I've discovered that it's surprisingly hard to photograph your own bosom (how do these lonely housewives manage?) so improvised with a stuffed toy wearing my t-shirt. The effect is much the same. Stolen Thunder make all their jewellery by hand in the UK, and whilst it's not exactly cheap (I know, irony fans), it's not really bank breaking either. Their customer service is extremely good (they had to resend my necklace after a mix up at the post office), and they put in a free packet of fizzers sweets, which gets my vote. I got my necklace using a 15% off code provided by A Little Bird Told Me (now expired), however there is FREE delivery on all rings this weekend if you use the code CHIPS. Sign up to their email mailing list for regular offers and discounts like this. Good to bookmark for future birthday pressies, no? NB. This is not a sponsored post (sadly for me). All opinions expressed are my own. My husband has been working away quite a bit recently - and when I heard he was going to Moscow, well, what else could I ask him to bring back? Yes, Matryoshka dolls. [Shame on you for thinking vodka. I have plenty of that]. He was able to meet up with a good friend of ours who lives there, and whilst she was rather scathing at my desire for 'traditional tourist tat', her assistance did mean that he was able to get a good set without paying the sky-high price he would have been charged as a non-native! I have actually been to Moscow myself some years ago, but foolishly gave all the dolls I had bought away as gifts, without keeping any for myself. Anyway, here is the set he chose - there are ten in all, and the smallest is only 6mm high! Aren't they lovely? He also brought back these on Elena's recommendation - I don't know what they're called, but they're fresh cranberries in powdered sugar - like a bonbon, but with a fruity burst in the middle. Sounds odd I know, but they're amazing. There's not much better than discovering a sweet that gives you one of your 5 a day! The week before Russia he was working in Barcelona, and he treated me to these lovely silver earrings. Very well chosen I thought, although of course I'd rather he didn't have to go anywhere (or at least was able to take me with him). Greetings thrifty earthlings! Hope everyone is benefiting from the same glorious weather we've had here in London for the past few days. A lovely friend of mine looked after smallest boy for a few hours on Friday, and in addition to boring household chores, I was able to have a more leisurely than usual stroll around the charity shops of the area. Naturally, this being the UK, the temperature nudges above 12 degrees centigrade and convertibles are brought out of hibernation for their annual outing, men are shirtless outside the pub, and women start dressing for the set of a MTV video shoot. Obviously I'm not entirely immune to this phenomenon, my first finds being a cross between Copacabana and Kanye. The fabric behind the china buys is from a vintage St Michael double flat sheet. There's loads of material so someone with the know-how could easily make a dress. It would certainly be cheap enough to practise on, so maybe I'll hang onto it for a first attempt. Otherwise it will provide several million patchwork squares or a mile or so of bunting. I did pick up a sundress from Boden as well, but that's destined for Ebay. It was quite expensive but is absolutely right for the season so I'm hoping to make a little profit from it without feeling like I'm ripping the charity off. Also, it's a bit big so makes me look pregnant. Not a look I need 3 years from my last baby. "Sorry darling, mummy accidentally spilt coffee on your bed , but never mind, here's a vintage hand quilted eiderdown instead! Oh, and I've put all your transformers in the attic. Just for today, let's pretend your favourite toy is this artfully distressed wooden dog on wheels!" Anyway, also on the linen rail was this cotton sheet, starring everyone's favourite alien. No, not Seven of Nine from Star Trek. E.T.! The sheet has these iconic pictures from the film - which is nearly vintage by Etsy standards, as it was released in 1982.